Trusted Counsel For Personal Legal Matters:Family Law, Criminal Charges, Serious InjuriesA divorce, an arrest or a disabling accident can turn your life upside down, creating immediate problems and anxieties about the future. At McCauley Law Offices, P.A., we understand that clients are entrusting highly personal and highly important matters to us. We strive to reassure clients and attend to their urgent concerns while we are positioning them for the best outcome. A divorce, an arrest or a disabling accident can turn your life upside down, creating immediate problems and anxieties about the future. At McCauley Law Offices, P.A., we understand that clients are entrusting highly personal and highly important matters to us. We strive to reassure clients and attend to their urgent concerns while we are positioning them for the best outcome. Attorney Carroll L. McCauley III has practiced in Panama City for 18 years, serving Bay County and surrounding communities of Florida, including military personnel of Tyndall Air Force Base and the Coastal Service Station naval base. We practice chiefly in divorce and family law, criminal defense and personal injury litigation. 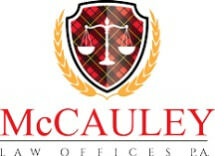 Clients can expect one-on-one attention from Mr. McCauley, who is intimately involved in every case. He is an accomplished trial lawyer who is in court nearly every week advocating for clients. We handle all facets of family law, from contested divorce and custody to paternity, orders of protection and child support modification. We handle every type of injury, from a car or truck accident to a slip-and-fall or dog bite. We can defend against any criminal allegation, from theft or DUI to drug crimes or felony assault. These are the times when you need an experienced lawyer. McCauley Law Offices, P.A., welcomes clients of all walks of life and provides a miitary discount to active duty personnel.